Carl Sandburg died fifty years ago yesterday, on 22 July 1967, and yesterday I discovered his short poem “Buffalo Dusk.” At first I thought the title referred to my adopted hometown, Buffalo, New York, but soon found it striking closer to my heart, as you may, too, if you read it. 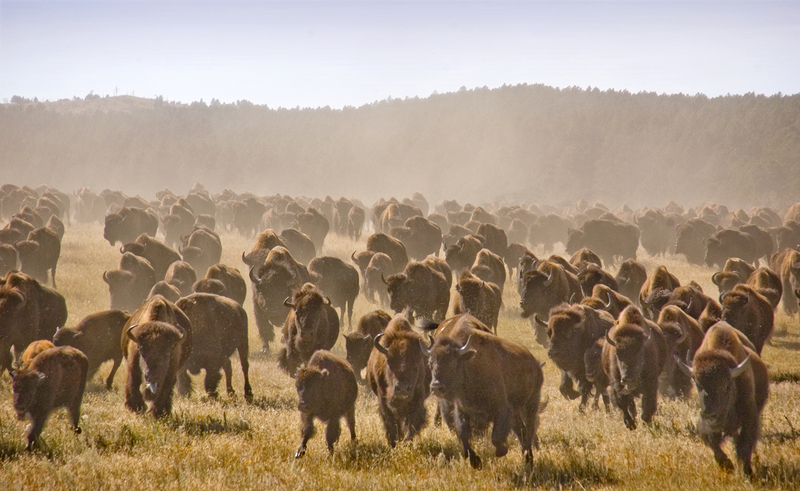 “The buffaloes are gone,” Sandburg wrote of the animals who “pawed the prairie sod into dust.” “And those who saw the buffaloes are gone.” We are left with reports but no experience of the awe the thundering thousands of those magnificent creatures – millions of them – struck in those who did see them. How poor we are, who can only read of the experience of others. (Confession now, with a measure of almost-but-not-quite-gratuitous venting.) To be honest, I include myself among them. For far too long – for most of my career, frankly, except for occasional outbursts when I’ve manifested something of my authentic, honest-to-God, gracefully eccentric Self – I’ve mostly followed the crowd and their whims, remembering the congregation that has paid my salary and buttressed my pension. I’ve too willingly served a particular association within the social institution of religion, remembering the bishops who have wielded their power to move me around, pawn-like. I have too readily acquiesced to the preferences of a church in which, at every level high and low, gatherings increasingly assume the form of an emotional pep rally rather than open the possibility of deep encounter with Great Mystery. And I’ve led such congregations and gatherings! A vicarious experience of the open West with its herds of cattle or buffalo won’t suffice. Neither will any vicarious experience of an earlier generation’s original encounter with the living God. To paraphrase Annie Dillard: We need to row out into the terrible thick darkness and stop contenting ourselves with playing pinochle in the bottom of the boat. Or Emerson: We need to stop groping among the dry bones of the past or putting the living generation into masquerade in yesterday’s faded wardrobe. “The sun shines today also,” he wrote in the introduction to his essay “Nature.” “Let us demand our own insight and experience and worship.” But who does that anymore? Sandburg was right, the buffaloes are gone. The early Christians are gone. And the sun rose today on a world that is “new every morning” (Lam. 3:23), as new today as when “darkness covered the face of the deep” and “a wind from God swept over the face of the waters” and suddenly “there was light” (Gen. 1:2-3). And “our own insight and experience and worship” wait to be claimed. There are many wonders and signs to be evinced. We no longer (if we ever did) need to teach one another to know God; we need only discover and liberate the treasure we carry in our hearts.